Prisms of crystal illumination fascinate me. Beams of refracted light coursing through an object and projecting colorful rays on surfaces leave me spellbound. 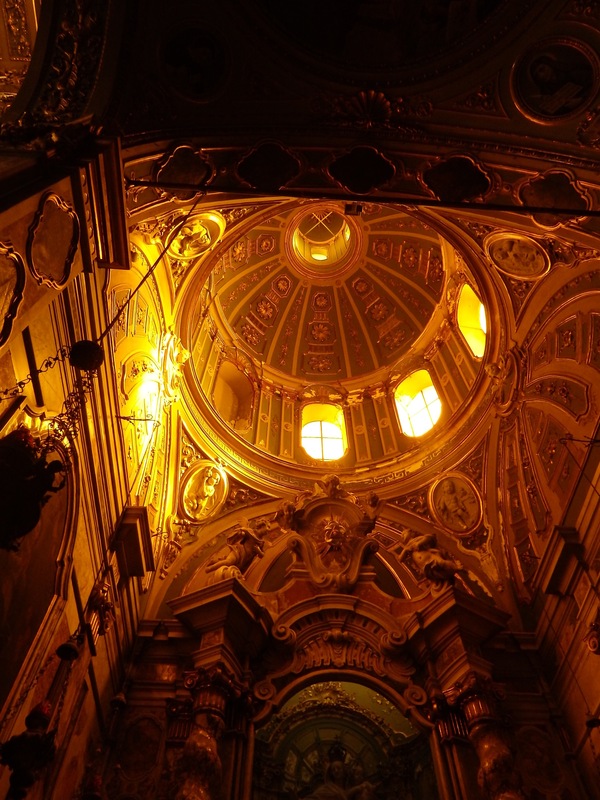 What I stumbled upon inside the Basilica of Santa Maria Assunta at Camogli during a recent visit brought this vision to mind. 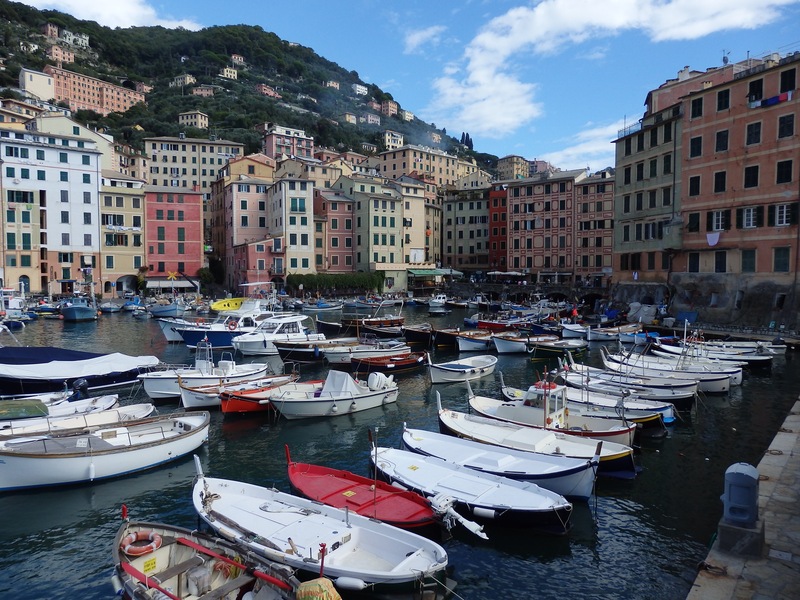 After leaving Chiavari on a grey morning in late September, I headed up the Ligurian coastline to explore some of the villages on the Riviera before reaching Genoa. Blue skies fought against the dark clouds that threatened rain for most of the morning, finally claiming victorious sunshine by afternoon. 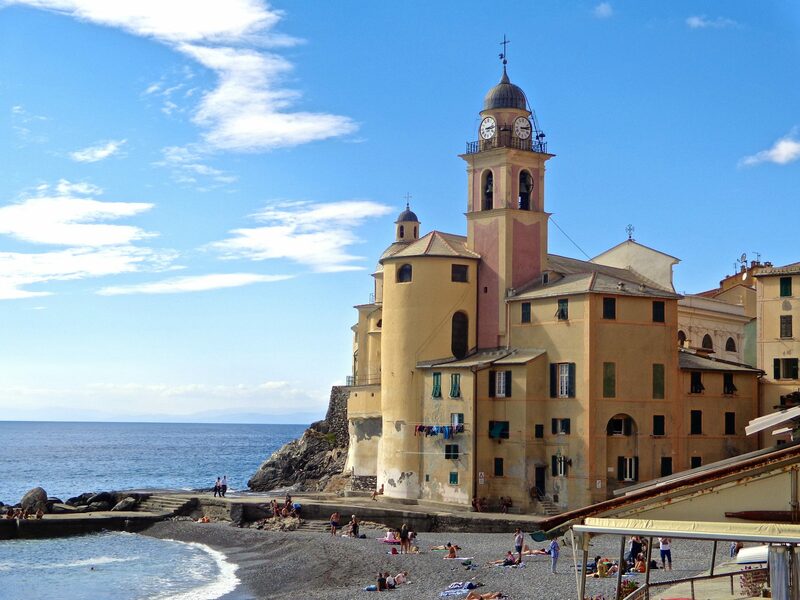 It was then I arrived at Camogli. Pulling up on a road above the little village, I parked the car and walked down toward the waterfront. As tall narrow pastel houses began to loom up before me, my pace quickened. I could see a glimpse of the water just beyond them, on the other side of a small piazza. Finally reaching it, I noticed a bay hugging the cobblestones. It was very much alive with many colorful bobbing boats. After stopping for a delicious Affogato, an espresso with crema gelato, I wandered up to the Basilica of Santa Maria Assunta. It rose like a bulwark, a mighty fortress showing the wear of time and the relentless lashing of waves. I walked around it to the right and started ascending a narrow flight of old marble stairs. 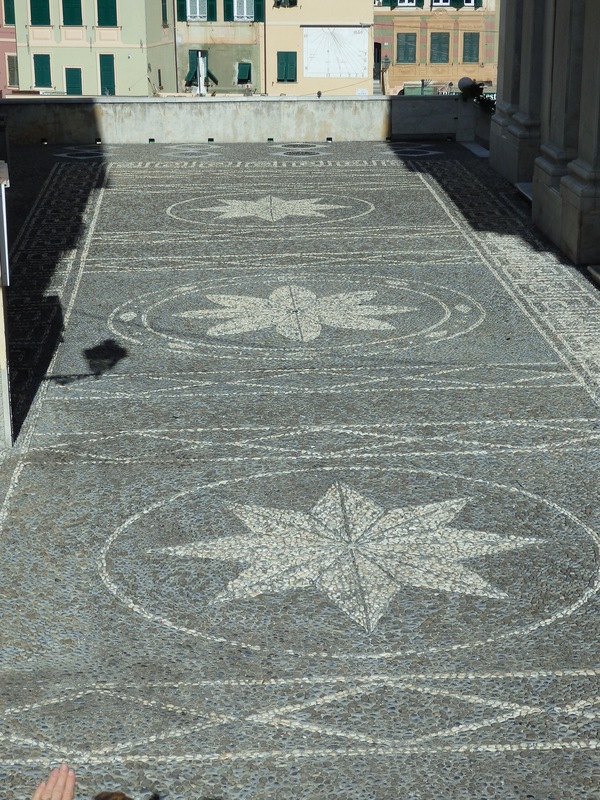 I came upon this beautiful stone mosaic floor with star designs which made me think of Mary. She has often been referred to as being the ‘star of the sea.’ Perhaps this was intended to symbolize her. As I turned and entered the thirteenth century basilica, I was immediately taken with its beauty and regal ambience. But what caught my eye more than anything else were the many crystal chandeliers hanging all about the interior. Dangling in chime-like elegance, it was a magnificent view to behold. 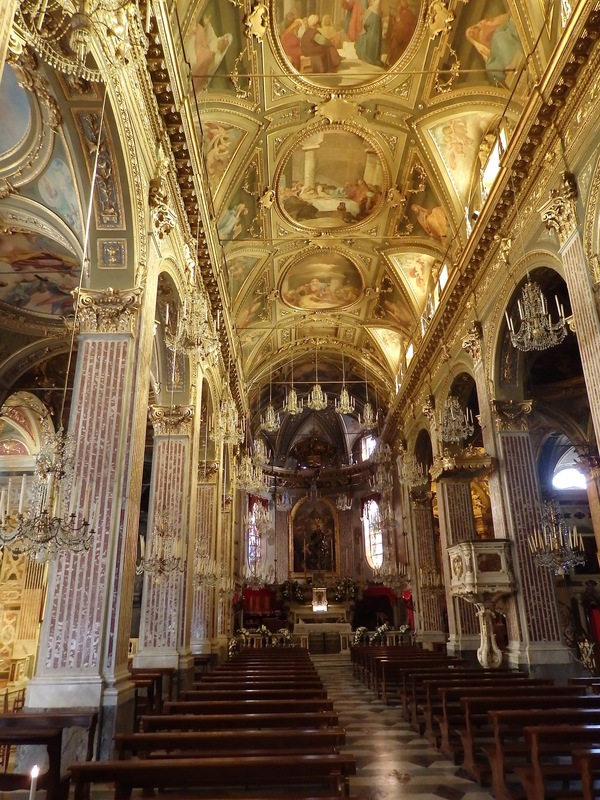 It didn’t take much to envision this entire basilica lit only by the chandeliers at night. The following photos were taken that day and I would love to share them with you. 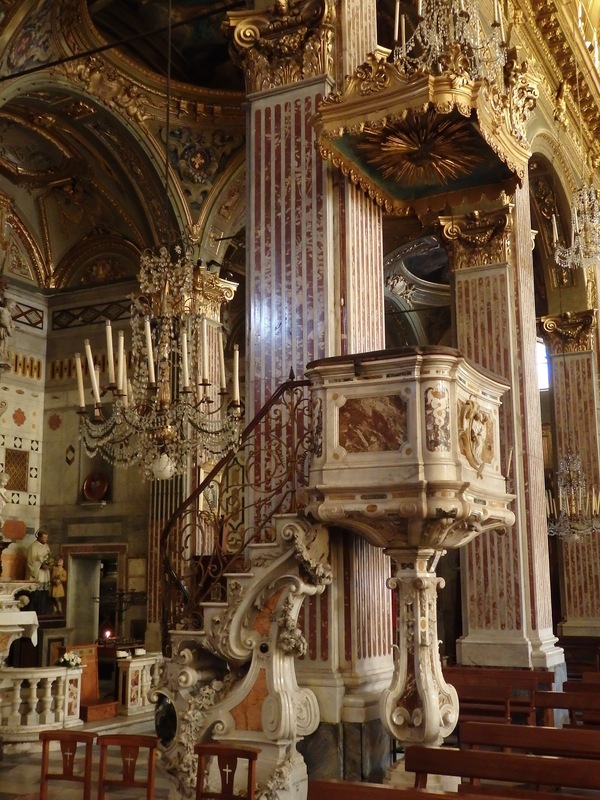 Marbled Priest’s Podium with overhead Baldacchino-marble floors, marble everywhere! 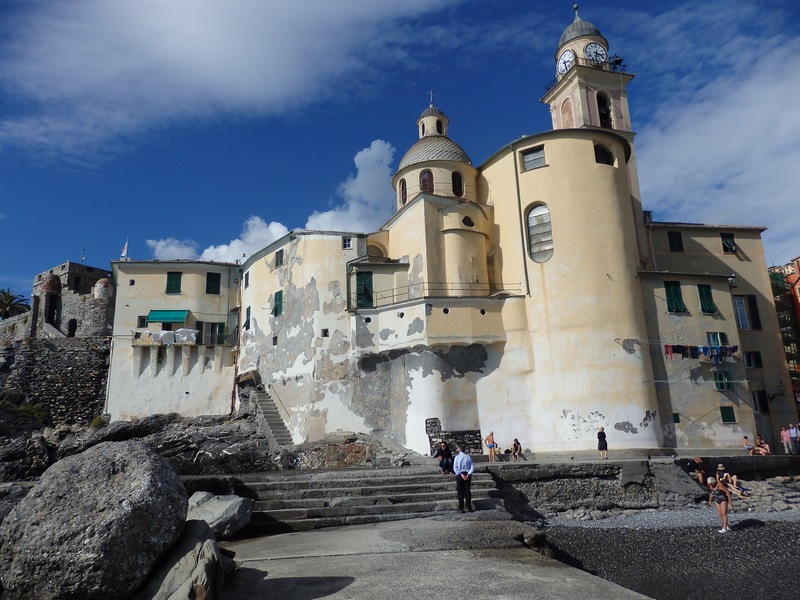 Built in 1200 next to the town castle as a chapel, the basilica stood high on a rocky promontory that was only accessible by a wooden bridge since it was separated from the coast. Today, after several renovations over the centuries, it rests on a cobblestone square reachable by a marble staircase. 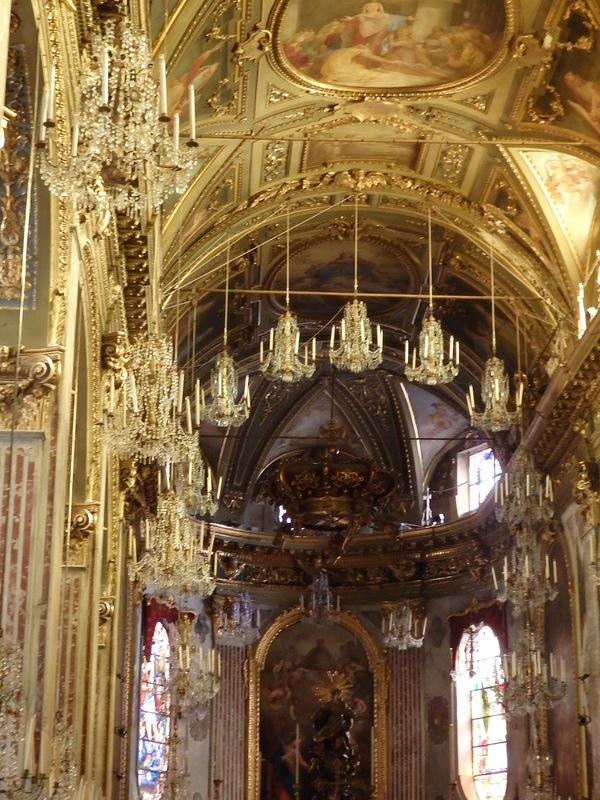 The neoclassical facade gives way to a beautiful baroque interior. The remains of St. Fortunato, patron saint of fishermen and sailors, rests in the basilica as well as St. Prospero, patron saint of the city. 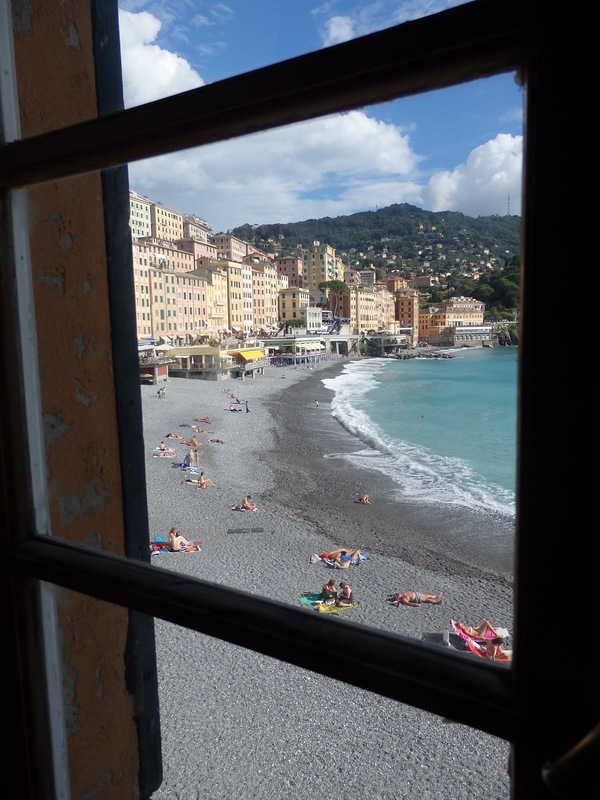 Before leaving the basilica, I saw the beach with sunbathers through a window. 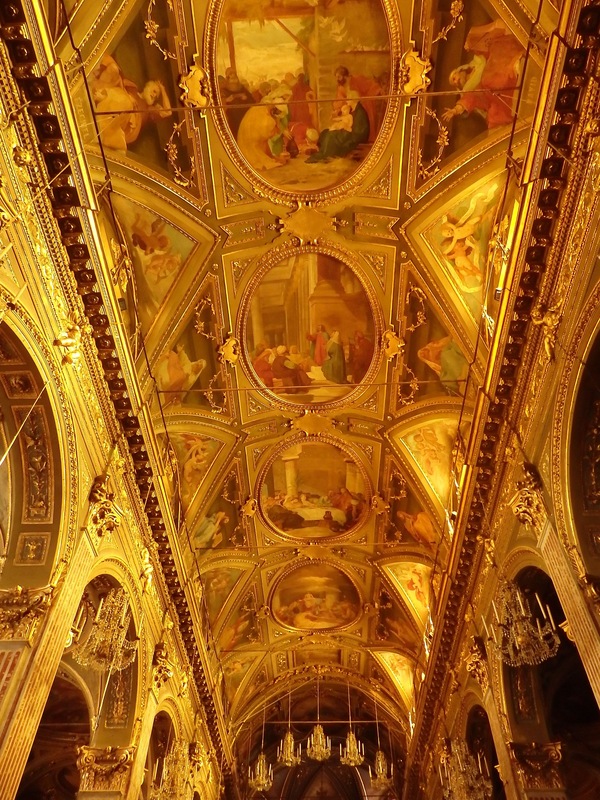 Heaven, sky, land and sea brought rhythm and harmony to this glorious old basilica. The modern and the ancient, today and yesterday, nature and golden prisms became one complete presence that lingers on in my storehouse of treasured memories. That first photo is really something, I’d like to see that in person! Gorgeous photos, Susan. So much history, art and architecture steeped in those walls. Thank you for sharing. Thank you Pat, it is always my pleasure to share. So glad to have people like you who enjoy them! Great post and pictures–thanks so much!